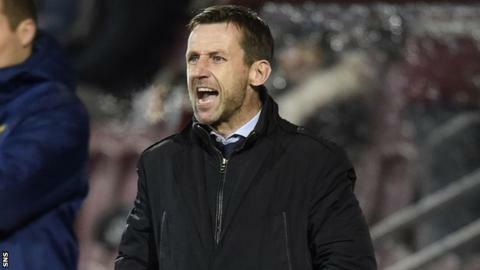 Angry Dundee manager Neil McCann described his side's display against Hearts as "one of the worst performances I've seen from us". The visitors lost 2-0 at Tynecastle, conceding a goal in either half, much to McCann's frustration. "Too many didn't perform and that's nothing to do with belief or confidence," he said. "It was going through the motions and we paid the price. I won't accept that." Hearts opened the scoring through Isma Goncalves, and after the break Cole Stockton saw a goal disallowed for the home side for offside before Christophe Berra secured the victory. McCann was unhappy with his players, believing they fell short of the standards he demands from them. "I'm trying to think of a way of saying how angry I am and how poor we were," he told BBC Scotland. "We changed our shape in the second half. But we were static and easy to play against. You're still hoping that our passing game would come off, because we work on it all the time. It has to be slick and incisive, and it was neither. It was so poor. "I won't make any excuses for them. I didn't like losing to Aberdeen [last Friday], but we should have taken something from the game. Tonight was no good either in performance or application. "They should be hurting, because I'm hurting, and those fans going back up to Dundee are hurting. That won't be tolerated, and we'll deal with it inside." Hearts manager Craig Levein saw his side win back-to-back games at Tynecastle, having ended a run of seven games without a win in Saturday's 1-0 victory over Motherwell. He felt the quality of his side's performance improved from the weekend, and the team was boosted by the form of 16-year-old debutant Anthony McDonald, who created the opening goal. He was joined in midfield by fellow 16-year-old Harry Cochrane, who came on for the injured Arnaud Djoum during the first half, and 19-year-old Lewis Moore, who worked tirelessly on the flank. "[McDonald] was really good, all the young boys were excellent," Levein added. "We have got some really good young players at the club. I didn't expect them to be on the field at 16, but if you're good enough, you're old enough. "The way it worked out, [McDonald] had to stay on and his adrenaline got him through the 90 minutes. It gives our supporters a little glimpse of the type of players who will hopefully be playing here in the next two or three years. "It was tight at times, but we had the better chances and deserved to win. The pleasing thing was that we saw more good football than we did on Saturday, there were spells of players feeling more confident and taking more risks, which leads to good football. "We restricted Dundee to very few opportunities and when they did get a shot on goal, Jon McLaughlin was very safe. With Christophe Berra and John Souttar in the team, we're always going to have a decent chance of defending well."